Standard Distant Step, Duck Step, or Turkey Step Available. Will my Birds be Smart Enough to Learn to Use it? Can you Adjust the Sensitivity of the treadle? Why is the Treadle Step so Small and Far Away? There are around 5,000 feeders out in service already but we just got around to making a soft close version as customers had asked for one. The noise of the door closing did make it a bit harder to train flocks but we got around that by training only when the birds were hungry and very motivated. And we simply didn’t have the time until last Thanksgiving. I had taken a feeder home with the idea that over the holiday I’d stare at the dang thing till I came up with a workable idea for a soft close feature. The idea of using a cabinet door soft close cylinder came to mind and it works very well, perfect size and action, easy to find replacement cylinders almost anywhere online or in hardware stores, and it was adjustable. They have been tested down to 10 degrees F, past that you need to do your own testing to learn at what temperature to back the adjustment screw off till it warms up. The worst outcome in sub zero weather is that the soft close feature doesn’t work but the feeder door will continue to open. Shipping on our feeders is expensive, they are bulky and get an overcharge for that reason but feeding rats and wild birds expensive chicken feed isn’t cheap either. Multi packs are simply individual feeders strapped together for shipping and boy does it save money. A two pack of feeders will ship for about 20% less per feeder than two feeders ordered as units and four Medium Feeders costs 46% less to ship than four individual units.. The more feeders you buy and ship the cheaper the shipping becomes, up to a point. The medium feeder shipping costs bottoms out at four feeders per multi pack, six feeders for the small feeders. 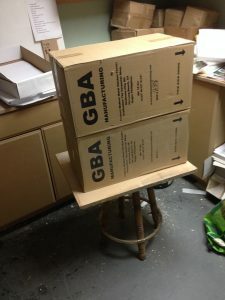 Once you get past those points the larger packages begin to get more expensive per unit to ship. 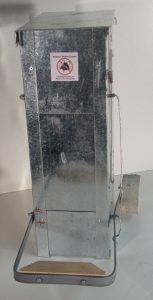 The shipping cost can get as low as $9.00 for a small feeder to parts of California and as low as $12.00 for a medium feeder to parts of California. Once you get to larger quantities we can ship 42 feeders per pallet. You can find a way to stop the wild birds and rats from stealing your chicken feed and it pays for itself. We do more than just make products that stop rats and wild birds from eating your chicken feed. We make nest boxes too. Made from galvanized sheet metal, hot rolled steel flat bar, and a wooden perch step for comfort in lower temperatures. Two hole, four hole, and six hole versions available. Shipped disassembled after factory assembly and disassembly with your choice of pop rivets or small bolts for re assembly. The landing perches fold up if you want to prevent the birds from sleeping in the nest boxes (most birds won’t unless they are being picked on by the other birds) or you can drill your own holes through the nest box side and secure the landing perch in place using the bolts that are furnished as the bottom stops for the folding landing perches. The tops are angled to prevent birds from roosting on top, the bottoms are easily removable for cleaning or dumping the old nesting materials. 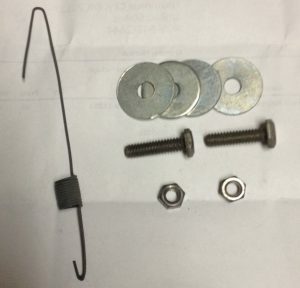 Installing is as simple as driving two screws or nails into the wall and hanging the unit using the provided straps. For years I said that a large feeder wouldn’t be feasible but a way was found and several hundred were produced and are now available. 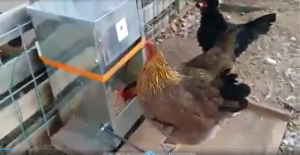 The feeder is identical to our Medium Ratproof Chicken Feeder other than being 4″ wider. It holds 37 pounds filled with chicken feed, 136 days for one bird, 54.3 pounds fully loaded total weight. The extra large feeder is 4″ wider than the medium feeder, the same width as the large feeder but it is 10″ taller. It holds over a full sack of feed, around 67 pounds of feed if you stuff it to the gills. 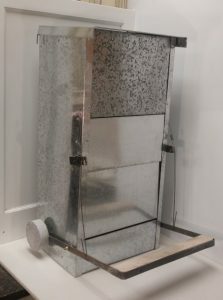 The shipping weight is around 20 pounds and it weighs around 89 pounds once it is filled with laying pellets. These new feeders arrived the third week of February and are now for sale. The Ratproof Dog Feeder is actually the same as the extra large feeder. 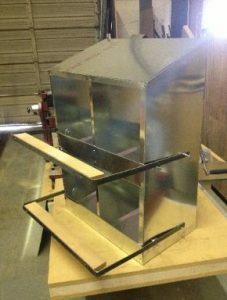 Making the feeder 4″ wider allows most breeds to use the feeder although the dog is going to have to weigh at least ten pounds to use the feeder. Inside is an adjustable throat that allows the larger dog food kibble to flow properly and an entire 50 pound bag of dog food will fill it to the brim. The dog steps on the treadle to open the feeder door. 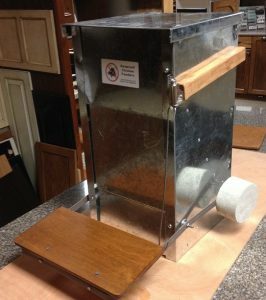 Why Do you Need a Rat Proof Chicken Feeder? If you have chickens and rats then one of them has to go. It is going to save you a lot of money on feed costs by keeping the rats, mice, and wild birds from stealing your chicken feed. Some users report that it also defeats squirrels. Many customers report a 50% savings in feed use once they stopped rats and mice from stealing feed, even higher savings when you stop wild birds from eating your chicken feed. Having chickens doesn’t mean you have to have rats. The feed is going to stay much cleaner without rats and wild birds walking in the feed. Chickens can’t get in to walk on the feed either and the covered door prevents litter from being thrown into the feeder when the hens are scratching in the litter. Your flock will be healthier once the vermin stop eating out of the feeder and bringing their diseases and parasites along with them. Commercial flocks know this and they go to great lengths to keep vermin out of their flocks. Rats and wild birds are the worst at spreading disease to chickens. 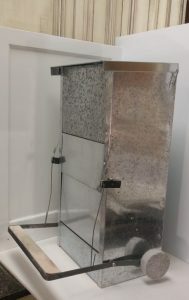 The medium feeder will feed a single hen around 100 days or ten hens for 10 days. You can go on vacation and not worry about the birds running out of feed. 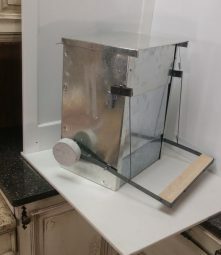 This feeder is simply the best rat proof chicken feeder, the best rodent proof chicken feeder, the best wild bird proof chicken feeder, and the best automatic treadle chicken feeder on the market. Now is the time to stop the loss of chicken feed to rats, wild birds, mice, and squirrels. Just because you have chickens doesn’t mean you have to have chickens and rats.